I was up until 2am working... I gotta stop doing that, and have hit the ground running this morning returning emails and phone calls, and working on packing and shipping orders out. My kids are difficult this morning because a) Noah is teething, b) Josh hasn't had a proper night' sleep in days and that gets him so wired I have to continually peel him off the ceiling and c) my daughter is generally a handfull. Think twice about running a business at home with small kids. It is indeed a very challenging task! I have people throwing things at me left and right and I am having trouble keeping up. Just in the last 5 days , three more groups asked me to come and do things for them. I hate to say no because while classes are going great, Crops are all of a sudden bombing, and Dec is usually a terribly slow month for me - everyone is spending their money on Christmas. On the flip side, I finished two projects I have been wanting to do and I am pleased with the results. See other great samples of the paper wreath done by Mardi and Nordica in the Scrap with Shelby Forum! Don't have time to fold all those flowers? Get those left over Prima flowers and use those up. 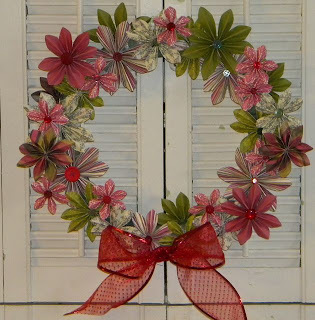 Simply hot glue onto a floral wreath. 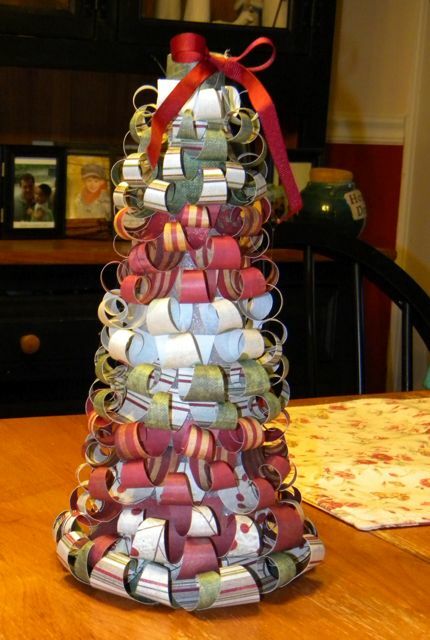 This will be added as an option onto my Christmas gift class. It's less than $10 to make! Oh Shelby girl, love your wreath, it's it fun? That tree is totally amazing!!!! !